wow! 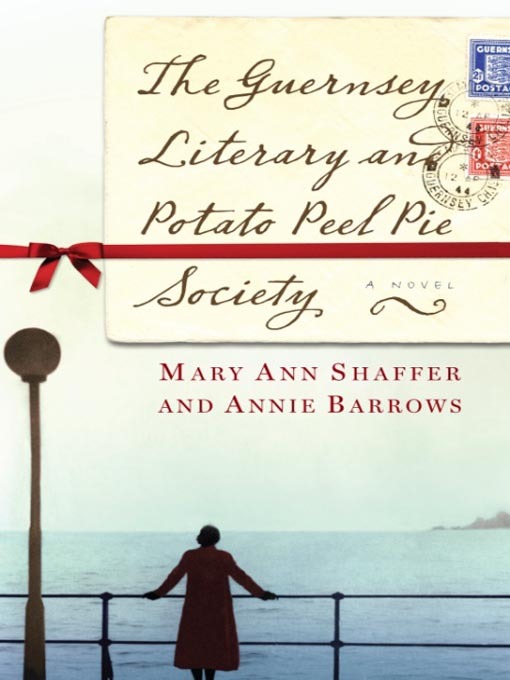 isn’t that title a mouth full?i just finished reading the guernsey literary and potato peel pie society last night.it was a delightful book!i have to admit, in the beginning it was kind of hard to follow since the story is written out through letters back and forth among lots of people. i had to re-read the first 30 pages to get it all straight.but, once i figured out who was who, it was a great read!i loved the main character juliet. she is witting, charming, and cleaver, and you can’t help but like her!the book takes place post world war II in england. writer, and main character juliet is seeking out inspiration for a new book when she discovers stories about the people on an english island that was occupied by the germans in the war. she then travels to the island to put the book together and falls in love with all the locals.a darling book, i’d recommend it. and, it’s a very fast read too!so, have you read it? did you like it? oh..i am so glad to read this review…i have been seeing this in the bookstore for ages and the title is so appealing i wanted to read it…but knew nothing about it. thanks for the timely review..i will pop over to the bookstore today to pick it up! yes, it's such a charming book. delightfully sweet + poignant without being saccharine. I read it. I liked it. In fact, I enjoyed it very much. Can totally see it being a movie too. I have been wanting to read this too! Thanks for the review! Check out my awesome GIVEAWAY! This was my book club's choice the month before last and we all loved it. The letter-writing aspect of it was far more interesting than I expected it to be and some of the characters were truly hilarious! We all thought it was a good alternative to the typical war novel. We're doing a WWII theme with our book club and just finished 'The Book Thief', which we also thought was a fantastic alternative to the typical war novel. It's narrated by death and focuses on the life of a German girl. Really, really good. i couldn't agree more with your review. 🙂 i loaned the book to my mother who loves to read.. before i had a chance to read it and she gave up on it after a few pages. now that i've read it and totally enjoyed it i keep telling her what a mistake she made. i would also agree with one of the commenters above… it really made we want to write more letters! read it. loved it. Loved her sassy attitude. Loved getting to know the people through the letters. I also enjoyed how it made me sit and truly think about how many people suffered and the cruel treatment during that time. A fast and easy read too! Loved this book! I found myself becoming really involved in the lives of the characters. It made me want to start writing letters more often! A poignant and enjoyable read. My book club just had the meeting for this book today. Everyone liked it. All of the characters are really likable. i read this last summer and LOVED it! wouldn't it make a great movie? Such a lovely story, the characters are drawn so beautifully, I felt as though I was with them. I have recommended it to so many friends, and have given it as gifts. I look forward to re-reading! Read it and loved it. I was so happy to be drawn into that world. I love a good entertaining book that also widens your world and mind by showing you a slice of life you've never thought of before. I just finished it as well. I loved this book. The characters were so real and I really felt for them and cared for them. It had it's heartbreaking moments but it also had so many funny, light hearted moments. Love love love this book. It's my new favorite. Glad you enjoyed it too.